An orangutan’s lifespan is about 35-40 years in the wild, and sometimes into the 50’s in captivity. Orangutan females only give birth about once every eight years – the longest time between births of any mammal on earth, meaning only four or five babies in her lifetime, which is why orangutan populations are very slow to recover from any kind of disturbance. After about eight months of pregnancy, mothers nurse their babies for up to six years, because there’s so much for a young orangutan to learn in order to survive until they reach puberty at about eight years of age. 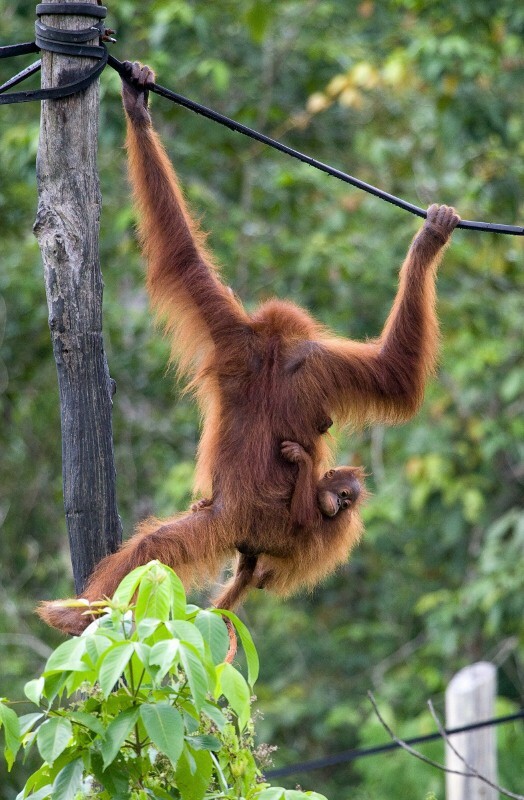 Young males may stay close by their mothers for a few more years, but as they mature they will travel long distances, paying little attention to other orangutans that they meet. Females may stay close to their mothers until they are into their teens, allowing them to observe mothering skills as they watch younger siblings being raised. Adult orangutans don’t form groups as other great apes do, rather living a fairly solitary life, other than mothers with babies and when finding a mate, which lasts for two to three weeks. When the males become sexually mature they develop many distinctive physical features. Fleshy cheek pads on both sides of their face and a high, fatty crown on their head. Their hair grows long and a beard develops on their faces. They have an impressive call that they produce with the aid of their laryngeal sac (found under their chin). This is called the ‘Long call’ and is used to locate and advertise their presence to females or warn other males away. A male orangutan can weigh over 90 kilograms and a female up to 50 kilograms. They are thought to be four to seven times as strong as an adult human male. 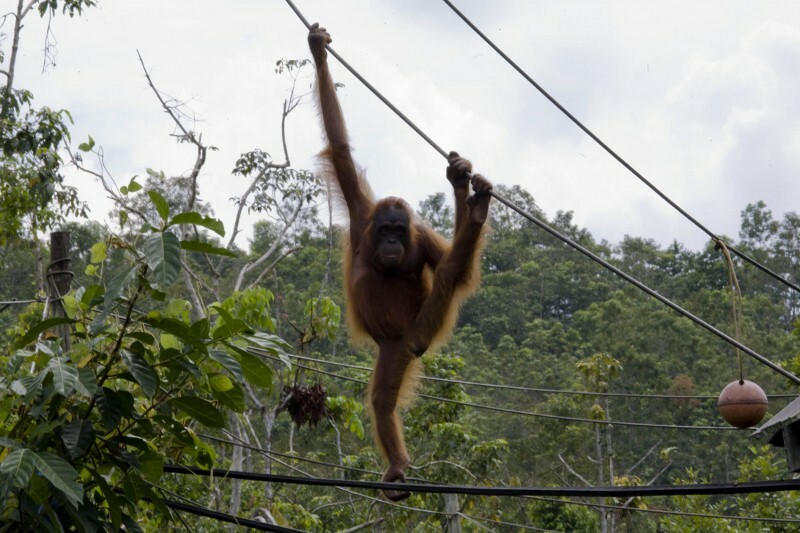 Orangutans’ arms are longer than their legs and when stretched out, their arm span is longer than their body. Their arm span can be up to 2.3metres!